This uplifting all-purpose spray combines the power of three effective green cleaning ingredients – lemons, limes, and vinegar – and it can be used virtually anywhere in your home from the bathroom to the kitchen to the windows. Just breathe in its fresh citrusy scent, and you’ll be inspired to get some serious cleaning done in your home! Not only that, but with its safe, eco-friendly, and cost-effective ingredients that clean and disinfect naturally, you won’t mind using it generously since it’s so easy to whip up another batch! Juice the lemon and lime and strain the juice through a natural cloth or unbleached coffee filter into a measuring cup to remove all the pulp. Otherwise, the pulp could clog the sprayer. Add the lemon juice, lime juice, vinegar, and water to a spray bottle. Shake well. Spray it on whatever needs cleaning and let it sit for a few minutes to allow mineral deposits to loosen, grease to dissolve, grime to lift, and surfaces to be disinfected. Rinse well with water unless you’re doing a quick cleaning, or cleaning mirrors or windows, then buff dry with a clean, soft cloth for a streak-free shine. The low pH (i.e., 2.0 pH for lemon and 2.2 pH for vinegar) and acid content of the citrus and vinegar (i.e., citric and acetic acid, respectively) make it an inhospitable environment for many microorganisms to grow. It is great at combatting germs and mold while you clean! Also, the high acidity level of lemons, limes, and vinegar help loosen mineral deposits, such as lime and calcium, and dissolve soap scum due to their alkaline nature. Plus, this cleaner helps remove stains, such as coffee and tea, so it is especially great for cleaning kitchen sinks and more. Re-purpose an old t-shirt. Cut it into cleaning cloths and use one of the pieces to strain the lemon and lime pulp. Use a hand-held citrus juicer. These are great if you have one. 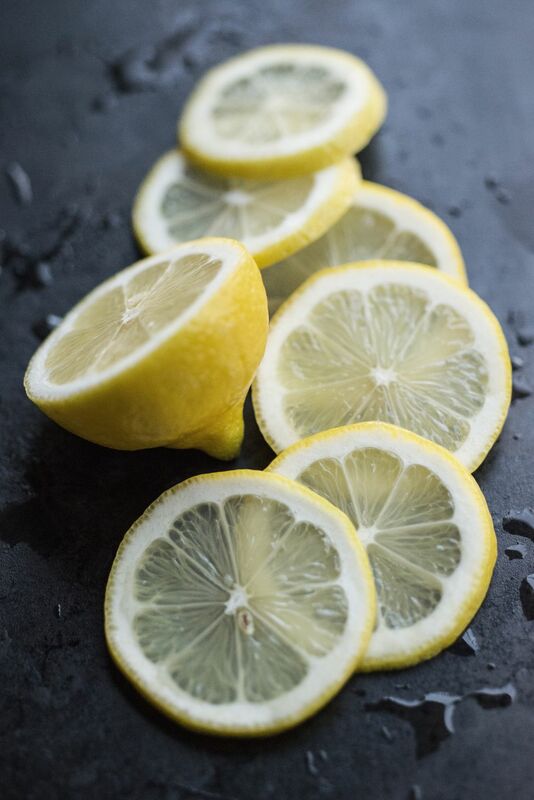 Squeeze the lemon or lime “ backward” with the inside of it facing towards the drainage holes so that the essential oils, which are antiseptic, antimicrobial, antiviral, and bactericidal, are released from the rind when it’s compressed. A definite bonus for combatting germs while you clean! Let the spray sit for several minutes for tough cleaning jobs. For mineral build-up around fixtures or excessive mildew in the shower, give this spray some more time to work before cleaning with an old soft-bristled toothbrush, or scrub brush (two of the top 10 tools to use for your green cleaning), respectively. Then rinse well. Use it with some baking soda for extra scrubbing action. Try sprinkling some baking soda or this aromatherapy cleanser in the sink, bathtub, shower, toilet, oven, or on the cooktop and then use the spray to dampen it to create a paste. Let it sit for a while for tough jobs and then clean away with a cellulose sponge or scrub brush and watch as built-up soap scum, dirt, grease, rust, and odors disappear. Caution: Products with vinegar and citrus juices are not recommended for use on marble since they can etch the surface.​ Vinegar can irritate your eyes if contact occurs. Flush liberally with water for 5 –10 minutes if the product gets in your eyes. Warning: Don’t ever mix vinegar with bleach. It will create toxic chlorine gas. So before using vinegar-based cleaning products, do a mental check to make sure you aren’t mixing it with any bleach-based cleaning products you may have forgotten about, such as drop-in toilet bowl cleaners or bleach cleansers, for example. Do Your Cleaning Products Contain Benzisothiazolinone? Should You Use Products With Sodium Bisulfate?